While in Italy Mini 4WD track races acquired great popularity, in a town of Sicily, Messina, a group of kids began experimenting street racing inspired to the anime Dash! Yonkuro. Despite the Mini 4WD street races were unofficially done anywhere in the world, they only grow up in Messina, thanks to a rather favorable climate. 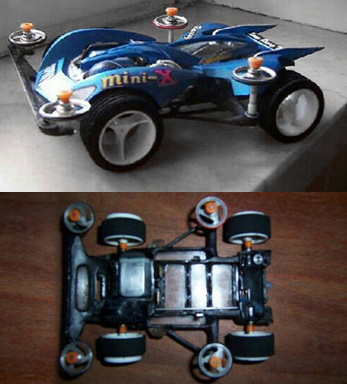 The first guide sticks of various shapes, sizes, weights and many Mini 4WD setups were tested along with Mini 4WD that would then decreed the basics of the street race. Many tests done in those years led to a well-structured regulation for the street races, a common idea of guide stick and the almost total use of the 5:1 ratio along with the stock motor as a standard basis in this genre of races. 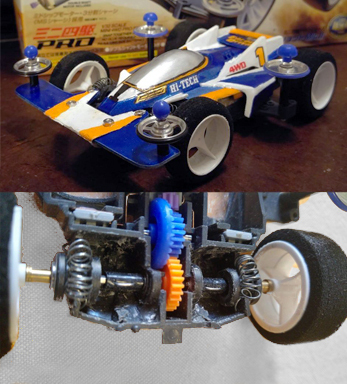 Some items and setups characterized the street races in the late '90s: the Low Bounce Tire set (15060), the Spike Tires (present at the beginning in the first Mini 4WD), the titanium axles (94326, used still today and very rare), and a particular obsession with Type 3 chassis, considered at that time as the only chassis that can deal with all the paths that a street race could have proposed. 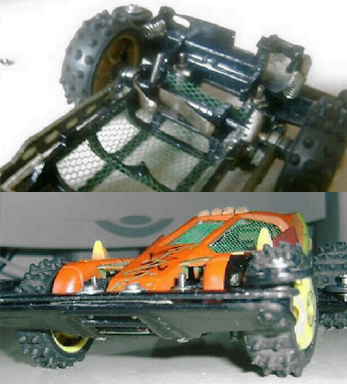 The Tamiya items were used as they were on the market and rarely customizations were developed. An exception were the numerous experiments on the mechanics of type 3, ie "composed gears": changes to the gears and to the chassis which gave the opportunity to take advantage of numerous gear ratio not sold by Tamiya (5.2:1, 4.6:1, 3.5:1, etc ...). Finally a timid attempt of improvement of the propeller gears through the use of bushings and metal disks was developed. Low Bounce Tire set; Spike Tires; Titanium Axles. In Italy the Let's & Go anime was broadcast, bringing with it new runners ready to experience with the Mini 4WD races. In Messina was the right time to start over in the street races: the now grown up boys of the 90s meet themselves together and helped the new generation to experience street racing. Meanwhile new cars were developed presenting increasingly profound customizations never tried before. Meritorious of attention are undoubtedly the Dash-2 Burning Sun by Somoja (2005) with a first rudimental front suspension system on type 3 and the electronic switch, the Spin Viper by Somoja (2006) characterized by a Type 3 FM chassis, the Super Shooting Star by ShInKurO (2006) with the first front and side flaps fiberglass and a full based bearings propeller shafts through the use of smaller bearings than those distributed by Tamiya. Finally street races move away from the Type 3 and new chassis are tested thanks to a new awareness: it is possible to run into the street with any chassis on any ground as long as it configuring a right combination of diameter tires and gear ratio. In this period the Sponge tires replace the Low Bounce / Spike Tires as standard basis to the settings for the the street racing: indeed, thanks to the 35mm sponge tires (upper limit of the street Regulation) it is possible to run an off-road path, while the performance of the 30/31mm sponge tires is significantly better on usual street tracks than any other rubber tire. 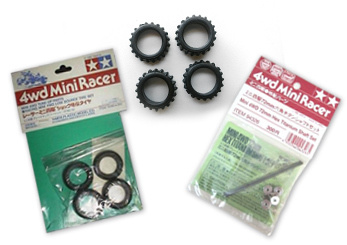 In the meantime in Japan born the first attempts at street racing thanks to the OFF-1, but the group split-up after few races and the developed cars not represent a significant element in the Street Mini 4WD history. Chassis and body are considered inseparable, a unique piece that represents a race car, and the runner to which it belongs. The car is therefore the symbol of the runner. 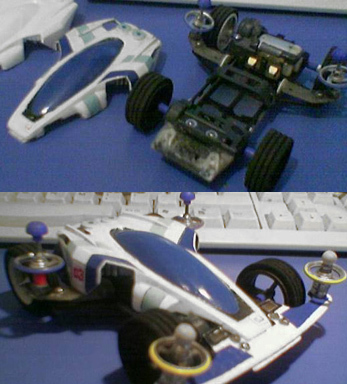 In this period the car icon in the Mini 4WD street races was born: the Dash-CB1 Geo Emperor by Kidouin (2009). 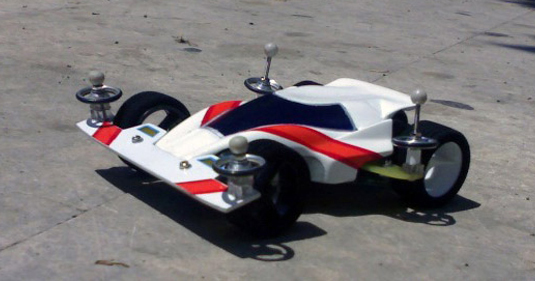 Thanks to its soft lines and meticulous care on aerodynamics, the CB1 inspired numerous other racers from other Italian regions to take part to Mini 4WD street races. It born the first wiki dedicated to street racing (2009) that collected at the beginning notions drawn through published articles on ShInKurO site. Later this portal is expanded with numerous other articles written by other runners. 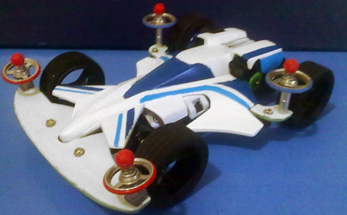 Relevant in this regard is the first guide to building a customized Mini 4WD written by Natureboy while building his historic car: the Aero Solitude (2010). Finally the first national meetings begin (2010) which first involve runners from Sicily and the new riders coming from Veneto, later will be joined by runners from Lombardy (2011). 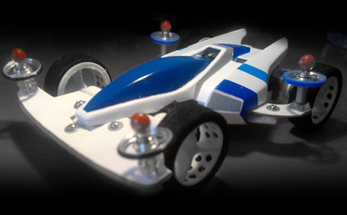 Thanks to many more exciting challenges, new cars are developed, among them it is possible to cite the Spin Viper by Somoja (2010) that astonishes at stability thanks to his particular chassis, the SuperX FM (FMX), while the Ray Hawk Gamma by ShInKurO (2010) offers a new way to improve the overall stability of a Mini 4WD: the promoter of torsions. Finally we come to customize the chassis to the point to change not only the ratio gear but also the wheelbase: the first street car with modified wheelbase (from the original 84mm of SuperXX chassis to a 82mm one) was the Dyna Hawk by ShInKurO (2013). The street racers throughout Italy decide to open accounts and pages dedicated to the street races on major social networks. Thanks to these accounts, the first tentative steps in street racing out of Italy and Japan are done: Blazing Salvo by Kadaladak (2016) is the first Indonesian street car with quite interesting features. 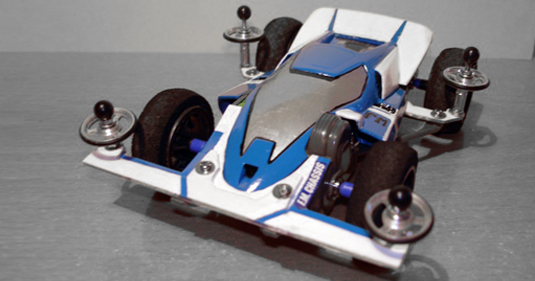 By means of a totally self-built bodywork made of PET and a chassis with a particular implementation of the promoter of tortions, the Blazing Salvo is the first Mini 4WD street car with variable wheelbase. 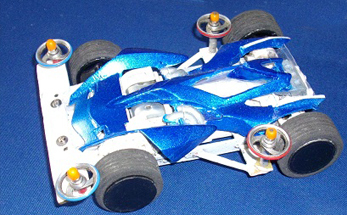 Thanks to the new chassis with central motor sold by Tamiya (MS, MA) and using the Japanese structures designed for technical tracks as a source of inspiration, the street racers develop new customizations suited to street races: in this period the Hyper Dash-3 Shooting Proud Star by ShInKurO (2016) is born. The Proud is mounted on a MA on which a suspension system which significantly increases stability on uneven surfaces was developed. 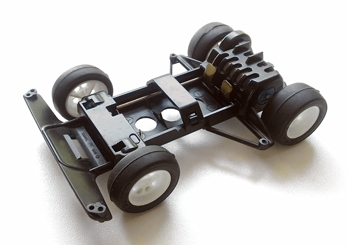 Furthermore, the wheelbase of the Proud is 82mm (originally the MA chassis has 80mm) and is able to mount a gear ratio equal to 5: 1 (has not been distribuited by Tamiya for MS / MA chassis). 2017 was a successful year for Street Mini 4WD races. 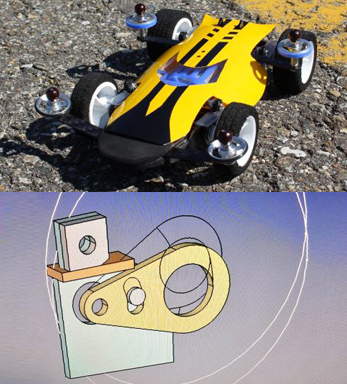 In Italy new attractive modeling solutions are being developed: the Yonkuro's Thunderstruck (2017), equipped with the first independent suspension system and the Kronin's Poison Dart (2017), with a leaf spring suspension system and a PET body, amaze and delight fans and the most expert street racers. The Street Mini 4WD meetings continue to be organized in other italian locations such as Rome, Turin and Genoa. The Street Mini 4WD national meetings at the end of this year take the official name of the Street Italian Cup. 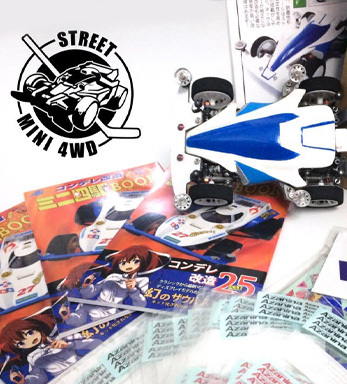 Meanwhile, the notoriety of the Street Mini 4WD notably grows up not only in Italy, but in particular way in other countries of the world, thanks to the collaboration of many japanese and indonesian fans. In Indonesia, the Street Mini 4WD has its first official representative, Fu-Rush Mini 4WD, with the purpouse of spreading the Street Mini 4WD philosophy in his country. The first Street Mini 4WD international meeting takes place between Italy and Japan: in the summer of this year Kronin takes part in the first Street Mini 4WD meeting in Sapporo organized by TUNE. In the same period the italian Street Mini 4WD group sends a representative mini 4WD of street races with the purpose to take part in the Condele (Competition of elegance) in August in Hokkaido. 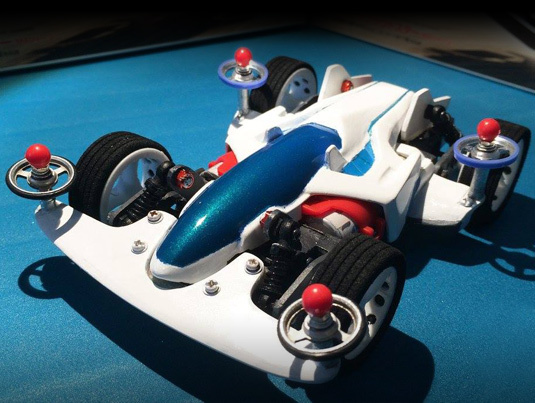 The sent mini 4WD, a Great Blast Sonic on AR, whose setup was ready to be used on street races, won numerous awards from Tamiya representatives who are very impressed with the Street Mini 4WD races. In September of the same year there was an international meeting here in Italy: Kaz, a japanese blogger, went to Milan where he met the Italian Street Mini 4WD community. The meeting in Milan was profitable and allows other Japanese fans to get closer to street racing during the course of the next months. 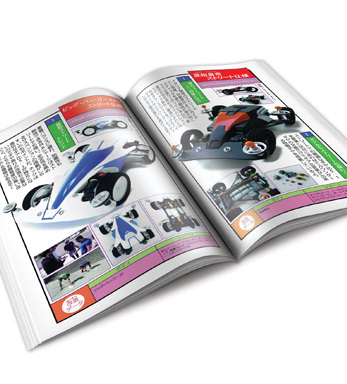 At the end of this year the Street Mini 4WD on the japanese publications of fans appear too: the prestigious photographic review published by RS_AZANINA sold in December in Japan also includes two Italian Street Mini 4WD cars: the ShInKurO's Big Bang Ghost on MA(2017) and the Aran's Dash-X1 Proto Emperor on Type 5 (2014). Finally, two Facebook groups are opened for the Street Mini 4WD community: STREET MINI 4WD INDONESIA (OFFICIAL) and Italian / groups / mini4wdstreet / Street Mini 4WD Club ITALY that already count dozens of members.